I'm not really a fan of chat shows but I love this show. Even though they're just promoting movies and new albums (or even TV shows we don't get here), it's still an entertaining format. Last night Matt Damon said it was the best interview show he'd done, and he meant it - and I think it's because it's quite different to other shows, in that it doesn't necessarily stick to the set questions. There seems to be a lot of time on the tangents before they get to plugging the film and the usual questions. Do you like it? If you don't, why not? I would have to agree Graham Norton, does his homework; surprising even his guests with his (seemingly) random knowledge, at times At times, I think he does get bitchy, but there is an ease in his shows, that isn't in others. Although I try not to make a point of always watching his show, I more often than not, do. Especially if he's got interesting guests on. The music segments are generally first rate and right up to the minute (often people you've never heard of, but end up enjoying). I discovered Elly Goulding from Graham. 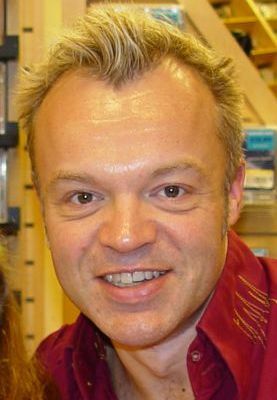 Graham Norton, is so csmp and random, but he'll go where no one else has gone before. And, he's never repetitive. Even my teen enjoys his show occasionally (she'd watch more often, if I let her though. He definitely brings out the best in his guests and, I think, after often doing a gruelling circuit, they appreciate that and undoubtedly, they give him something extra because of it. I liked Katy Perry, the X-Men trio and Robert de Niro on it. Now going to try Hendrick's gin because he said he drinks it on Graham Norton. If you say to someone, did you see such & such on Graham Norton, they will very often, say yes! I like Graham Norton, but I don't watch his chat show. I might catch the beginning of it before going to bed, but that is about it. Sometimes I will make an exception if there is a particular guest I want to see. Love it, very entertaining and really a great selection of guests. Graham Norton does his research and knows his guests. Graham is a natural entertainer, and he gets the really big big stars. How? I have no idea...because some never go on shows, but he does it well, so it's a winner for me. The guy is hilarious.He is that quick with his return answers and jokes he makes me envious.Anyone that hasn't seen an episode should.And yes,I saw the Matt Damon episode and it was one of Graham's very best.Ken P.
I sure do he is fantastic - he really brings out the best of all his guests! I have not watched it. Just from the ads I seem, the content can be a bit crude for me. Watched it once only, to see Gerard Depardieu. Really don't like the host. Not the type of interviewer I enjoy watching. Give me 'Parky' or the late David Frost, any Day!